Recommended for oral administration for the contrrol and treatment of the following diseases of beef and dairy calves caused by organisms sensitive to oxytetracycline: bacterial enteritis caused by Salmonella typhimurium and Escherichia coli (colibacillosis); bacterial pneumonia (shipping fever complex, pasteurellosis) caused by Pasteurella multocida. No pre-slaughter withdrawal period. 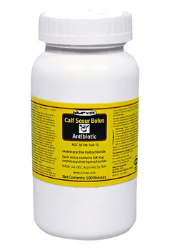 Safe for use in both beef and dairy calves. Powerful, each bolus contains 500mg of oxytetracycline hydrochloride for noticeable improvement signs in as little as 24 hours. Broad-spectrum antibiotic, effective against a wide range of microorganisms. Contains twice the amount of oxyetracycline hydrochloride compared to Pfizer's Terramycin Scours Tablets. For the CONTROL of bacterial enteritis and bacterial pneumonia in beef and dairy calves: administer orally half a bolus (250mg oxytetracycline hydrochloride) per 100 lb. of body weight every 12 hours (5mg/lb body weight in divided doses) for up to 4 consecutive days. For the TREATMENT of bacterial enteritis and bacterial pneumonia in beef and dairy calves: administer orally one bolus (500mg oxytetracycline hydrochloride) per 100 lb. of body weight every 12 hours (10mg/lb of body weight in divided doses) for up to 4 consecutive days.